The Heart Nebula (IC 1805) and the Soul Nebula (IC 1848) are two giant molecular clouds located in the constellation of Cassiopeia. The two clouds are physically connected by a bridge of gas and reside in the Perseus arm of our Milky Way Galaxy. In the center of the Heart Nebula is the open cluster Melotte 15, which is one of many clusters formed from the molecular cloud. These clusters within the clouds are known as the Cas OB6 association, and the energy from their hot stars illuminate the surrounding nebulae. 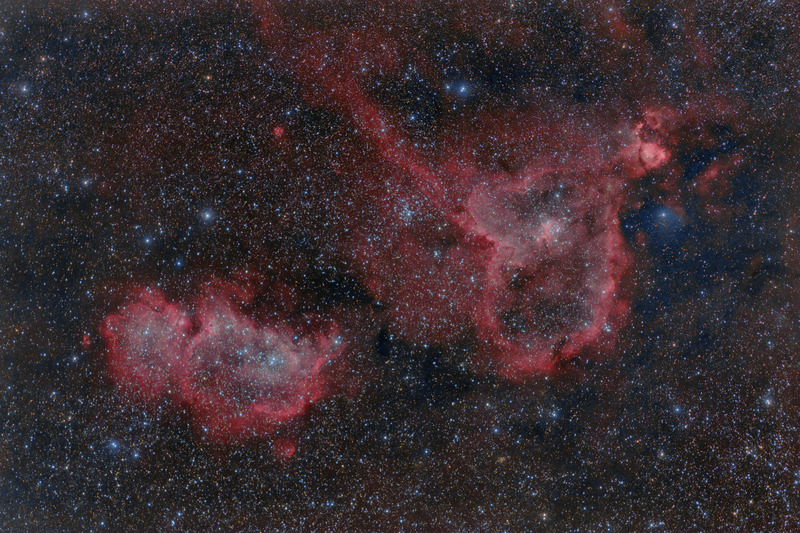 This photo is a composite of a Hydrogen Alpha version of the image with an RGB (color) version. Notes I still haven't figured out all of the nuances of combining Ha and RGB, so I wasn't able to bring out as much of the Ha in this composite as I wanted to. I think the overall color is pretty good, and I avoided an overly red bias to the HaRGB combination as well as the salmon color that can result from an overly aggressive application of Ha. Someday after I refine my techniques, I hope to recombine this image and improve upon it. This image was published in the Winter 2014 issue of Amateur Astronomy Magazine in my article entitled "DSLR Wide Field Imaging with Narrowband Filters:High Quality Images, Even from Light Polluted Locations".